Danielle Sered envisioned, launched, and directed Common Justice. 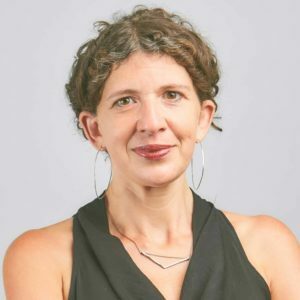 She led the project’s efforts, locally rooted in Brooklyn but national in scope, to develop and advance practical and groundbreaking solutions to violence that advance racial equity, meet the needs of those harmed, and do not rely on incarceration. Before planning the launch of Common Justice, Danielle served as the deputy director of Vera’s Adolescent Reentry Initiative, a program for young men returning from incarceration on Rikers Island. Prior to joining Vera, she worked at the Center for Court Innovation's Harlem Community Justice Center, where she led its programs for court-involved and recently incarcerated youth. Danielle has designed and directed programs that teach conflict resolution through the arts in schools and juvenile detention centers, has had extensive involvement in gang intervention work, has developed and implemented violence intervention and trauma-informed care practices and curricula, and has experience with a variety of mediation, restorative justice, and conflict resolution techniques. Danielle sits on the Downstate Coalition for Crime Victims, the Advisory Council to the New York State Office of Victims Services, the Diversity Advisory Committee to the federal Office for Victims of Crime, the New York State Governor’s Council on Reentry and Community Reintegration, and the Advisory Board to the National Initiative for Building Community Trust and Justice. She co-facilitates the monthly Executives Undoing Racism group with the Anti-Racist Alliance in New York. She has presented at dozens of conferences nationally, including the Aspen Ideas Festival and the Bipartisan Summit on Criminal Justice Reform, and is the author of The Other Side of Harm: Addressing Disparities in our Responses to Violence. She teaches about restorative justice at the CUNY Silberman School of Social Work. Danielle received the 67th Precinct Council Award for Service, given in recognition for leadership in reducing violence in Brooklyn, and the Brown Memorial Baptist Church Extraordinary Woman Award. Under her leadership, Common Justice received the Award for Innovation in Victim Services from Attorney General Holder and the federal Office for Victims of Crime in 2012. A Stoneleigh fellow, Danielle received her BA from Emory University and her masters degrees from New York University and Oxford University (UK), where she studied as a Rhodes Scholar. What about those who survive?